KALAMAZOO, MI, USA, April 12, 2019 /EINPresswire.com/ -- Polyphenols are molecules found in plants. 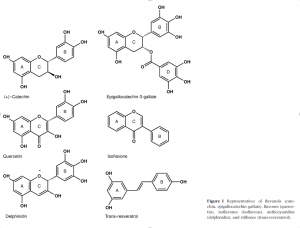 The beneficial properties of polyphenolic extracts, such as fulvic acid concentrates, demonstrate an enormous potential in topically applied products for the prevention and therapy of UV damage, skin ageing and cancerous conditions of the skin, as well as providing anti-microbial activity, and anti-carcinogenic properties. Many skin care products have been developed in recent years based on polyphenol-enriched extracts, like green tea. To exert their designated biological activities, topically applied substances need to be released from the formulation to reach the skin and to overcome the Stratum Corneum -- the horny outer layer -- barrier and penetrate into the epidermis and dermis. The release of active substances and their absorption depends on the molecular properties such as molecular weight and lipophilicity, but also on the vehicle -- oil based, water based -- formulation [4,5]. The formulations must be chemically, physically and microbiologically stable to assure the stability and deliverability of active substances to the target skin layers. Numerous studies suggest that polyphenolic extracts are very useful ingredients for both sunscreens -- as preventative -- and after-sun -- as therapeutic -- cosmetic products. Polyphenols have anti-carcinogenic effects as demonstrated in several skin tumor models [6,7]. They also support the skin's clarity, elasticity, smoothness, hydration and firmness.